I have decided to talk a bit about a sub-set of Explorer Yachts and Yacht conversions, the Yacht Tug conversion. There have been a great number of these tug conversions done from harbor tugs and near coastal tugs in the 70' (21 m ) to 100' (30m) range. The harbor tugs and near coastal tugs make good coastal cruising boats but are really not very good long range world cruising vessels. The larger ocean going and salvage tugs are the best base for an Explorer Yacht Tug conversion. They have the range to travel the world or stay on location for months at a time without resupply, the sea keeping ability to be out in any weather and the base equipment is highly reliable and designed to endure for years and years. The basic designs of the 40s and 50s are still in use today and have saved many lives and vessels over the years. The design and build and equipment of the base tug is what sets them apart from all the other "white" yachts in their size range. This gives them the ability to meet a demanding owner's schedule with the same reliability that has to be achieved in the demands of the commercial world. A yacht tug is in the Med and the owner wants it in another location 6,000 nm away. The captain can calculate the distance, average speed 12 knots and say we will be there in 20.8 days and knows with a very high level of certainty that he will make his mark. The other advantage the tug conversions have is that they are very fuel efficient in comparison to a "white" yacht. Seawolf is an example of a high-end mega yacht finish. She is based on a 193' (58.83m) x 35' (10.8m) x 15' (4.5m) ocean salvage tug built in 1955. She has a range of 12,000nm @12knots, so just short of half way around the world on one fill or 41.5 days of steaming. Seawolf was created at the renowned Dutch shipyard J. & K. Scheepweren N.V. Scheepweren was famous for building very high quality commercial vessels and built another one of the Tug conversions in this list. Her original design showed her Dutch heritage in her graceful looks and highly functional design. Seawolf was built as Smit Clyde, and had a historic career as an ocean going tug including simultaneous towing of two United States aircraft carriers from Boston to Japan. The same abilities that made this possible exist today in her present form. The heart of Smit Clyde still beats strongly, twin JOKE Smit- MAN engines that drive a single shaft allowing you to run one or two engines as needed. These long lasting slow turning engines are still serviced by MAN as there are a number of them still in use throughout the world. In 2002 she was converted to be a Explorer Yacht tug and was presented at the Monaco Boat Show. I was aboard her at the show and she was a major hit there. She did not have all of her present elegance or updated functions but she stood out as a true go anywhere anytime yacht. When she was purchased and renamed Far Niente she was refit and updated again to a higher level. Her present owner who changed her name back to Seawolf has continued to upgrade her to have all of the amenities and luxuries of any mega yacht and has still kept her solid seaworthiness. Seawolf now has active zero speed stabilizers, bow and stern thrusters and navigation and communications suites that match her worldwide cruising. Seawolf is one of the few conversions that has been fully faired outside, has full teak decks and high-end paint to make her a jewel of conversion tugs. There is a warm classic wood interior that surprises you with all of the modern features. The layout holds 6 guest staterooms, including a large Master, VIP, double and 2 twins. Her expansive deck space allows her to carry a 29' tender, 17' tender, Seadoos, 29' sailboat, kayaks, Optima sailboats and dive center and many other toys. In the past she had a fully functional heli pad with fueling. This could be put back in place with the removal of the swim spa Seawolf has chartered extensively around the world and is available to charter. Link to a recent 2017 Refit of Seawolf. 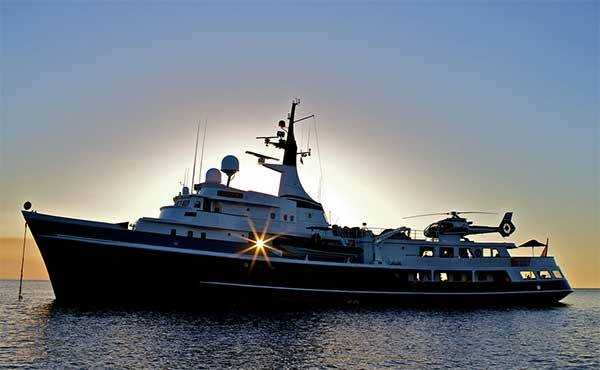 Seawolf is the epitome of luxury world cruising Explorer Yachts with the heart and soul of a commercial vessel. Sea Ranger is an example of tug conversion that was not done to full yacht standards on both inside and outside. She started life at Germany's Schichau Unterwasser yard in 1972 with a length of 255' (77m) Beam of 43'(13.23m) and draft of 21.9' (6.68m). She was built as a salvage tug and to tow oil platforms with massive twin Deutz-MWM 440 HP engines and a range of 20,000nm @ 12 knots. The head of the German yard Claus Kusch oversaw the conversion at the then Malta Drydock Company for a French owner Jack Setton who has gone on to convert or build a number of Explorer Yachts since then and she was re-named Simson S.
Her first conversion was fairly basic in nature with fairly simple changes to the existing structure and basic guest accommodations added. She was then sold to an American and received additional modifications to carry large tenders, seaplanes,helicopters and many other toys. The interior was refit with a mega yacht interior with exterior changes made to be able to fit the accommodations for 10 guests in 4 staterooms while still keeping her tug exterior feel. Over the course of 15 years she was used to cruise all longitudes and all latitudes including extensive Arctic and Antarctic voyages. At the end of his use the owner donated her to be used to cruise the world as a research vessel. Asteria sort of fits between the above two vessels in fit and finish. She is 160' (49m) long, has a beam of 31' (9.6m) and a max draft of 16.4' (5m). She was built by Anastassiades & Tsortaides in Greece. They have built a large number of commercial vessels, some yachts and are still building vessels. Asteria was originally an ocean-going salvage tug and was converted in New Zealand in 2002 where Cat 3516 engines were installed in 2013. 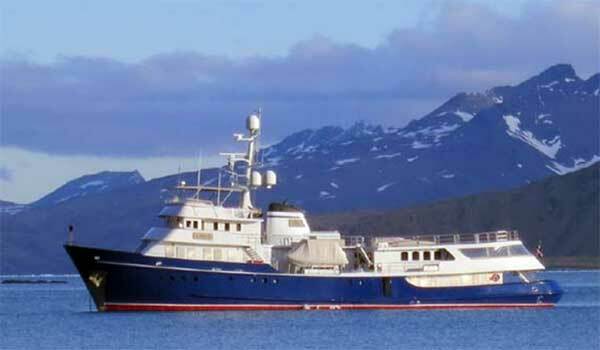 Asteria has chartered around the world, been to both polar regions and done the Northwest Passage. The fit and finish outside is commercial yacht level and the interior finish is comfortable yacht level. She has 6 guest cabins with a private master forward on the main deck. Asteria can carry a large number of toys including large tenders, RIBs, jet skis and a helicopter. She has been outfitted with zero speed stabilizers and other modern yacht features. I inspected her on two occasions during different Monaco Boat Shows and I found her to be practical, comfortable and well kept up. Like the other tugs she has been upgraded with zero speed stabilizers and all the modern amenities but keeps her ocean going design and abilities. One of the key features the owner loves about her is that she can be where he wants her when he wants her . Itasca is another high-end tug conversion based on another on a tug built by J. & K. Scheepweren N.V in 1961 with a length of 176' (53.60m) a beam of 35' (10.6m) and a draft of 17' (5.2m). 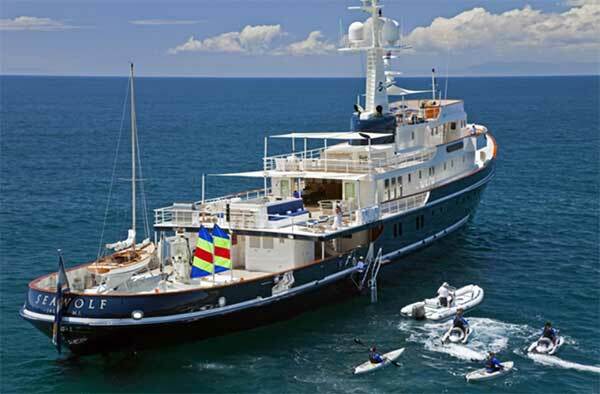 She can carry 10 guests in 5 staterooms. She was originally built as a salvage tug and has a range 13000 nm powered by Smit-MAN main engines coupled to a single shaft. Itasca was converted to a yacht tug in 1982 and in 1994 she made history as the first motor yacht to do the west to east voyage of the Northwest passage. She has traveled extensively around the globe. 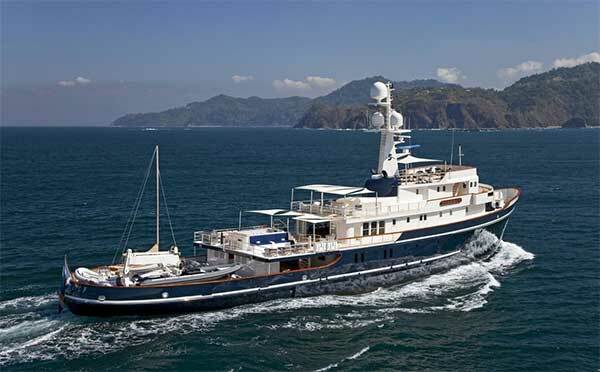 Itasca has a high-end yacht interior with the ability to carry extensive tenders, a BC130 B4 Helicopter and other water toys. The extensive interior is done in a classic look with many open lounging areas. She has a higher profile then Seawolf because of the extended house that has the copter pad above it. Her tug heritage has proven itself during the extended world cruising and has allowed the owners to visit places seen only by a few other people in the world if anyone at all. Please CONTACT US for information on other yacht tug conversions from 80' to 400' that are not displayed on this page. Please indicate what size range you are interested in.